Rotary Club of Braids - Welcome! Welcome to the Rotary Club of Braids in Edinburgh. Braids is a large and active Rotary Club on the south of Edinburgh and a Charity which delivers the aims and objectives of Rotary International - the biggest humanitarian organisation in the world -with over 1.2 million members sharing a common philosophy of "Service above Self". Rotary Club of Braids, Edinburgh has a well-earned reputation as a friendly and progressive Club where the emphasis is on fellowship and enjoyment in all we do. But it’s not just about enjoying ourselves, we also have a serious side that is just as important. We engage the local community over the South of Edinburgh in presenting challenges to help with the development of young people and raise funds to help those less advantaged than ourselves both at home and abroad. 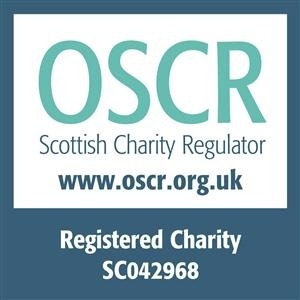 We provide vital funding for numerous local charities and to support overseas projects. Supporting patients and carers of the Headway Group (Edinburgh) by funding and arranging trips and excursions. We are also very active in Youth Services, supporting a number of personal development activities through local schools. Special projects such as refurbishing a Nansio District Hospital in Ukerewe, Tanzania and the potential to support a rainwater harvesting project also for that hospital. These are just some of the things we get involved with, so why not visit us soon and see how you could get involved. You will be made most welcome. Visiting Rotarians and guests are always welcome. Interested in joining us or becoming a member of the Rotary Club of Braids? Then Click here. You can help support the Rotary Club of Braids when you shop online from over 3,000 retailers. Every time you shop, you’ll raise a free donation for Rotary Club of Braids, it’s that easy! Find out more: https://www.easyfundraising.org.uk/causes/rcofbraids/ or click on the banner below. Then, the next time you want to shop online and help us, click here to log on. 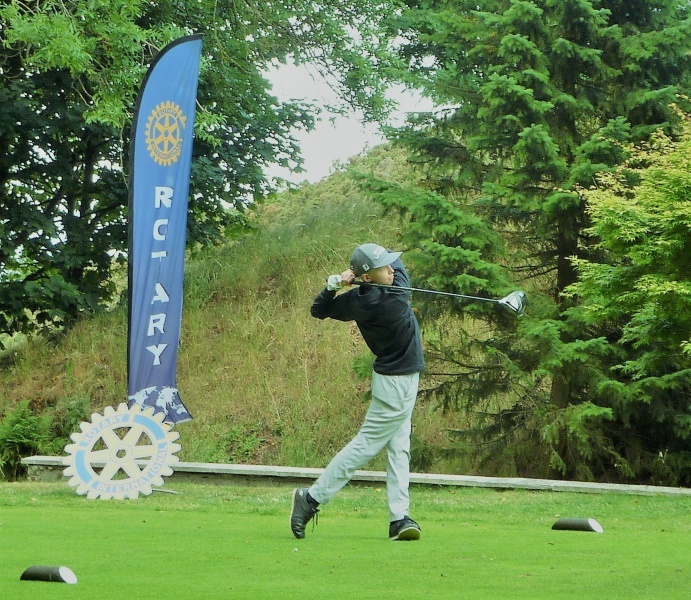 Once again Braids Rotary Club hosted their Young Golfer competition for 2018 courtesy of Mortonhall Glof Club. 1st Scratch: Danny Hendry, age 17; 73 Gross. 2nd Scratch: Malachy Hayward, age 16; 74 Gross. 1st Handicap: Alastair Kerr, age 17; 62 Net (78 - 16). 2nd Handicap: Sean Gallacher, age 13; 67 Net (84 - 17). 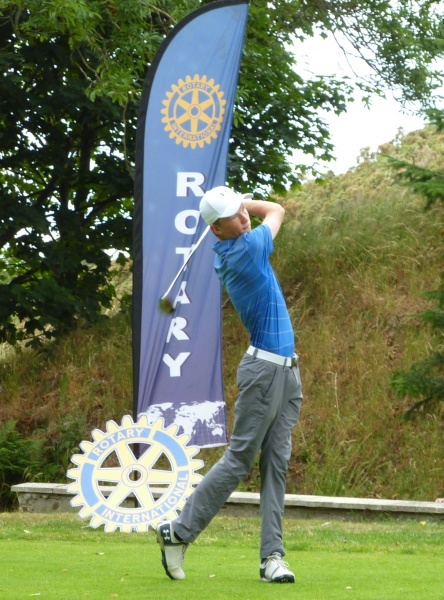 Jack Kinghorn, RCB Young Golfer. 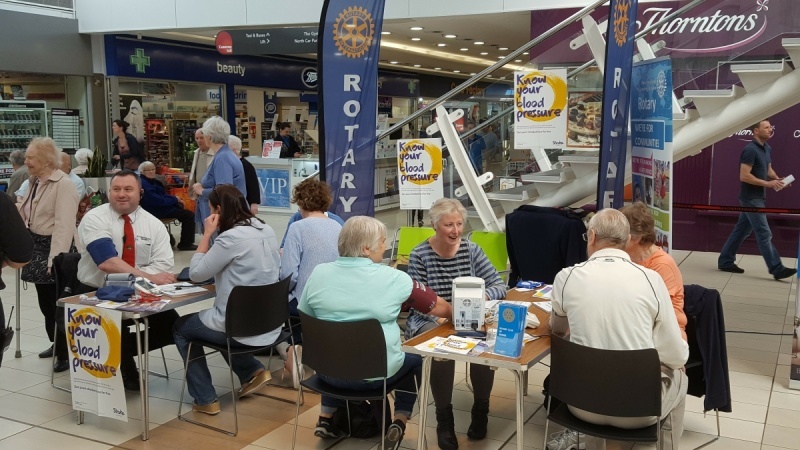 Members of Braids Rotary Club Edinburgh with volunteers from the Sick Children's Hospital held a Know Your Blood Pressure Day at Cameron Toll Shopping Centre on 21 April 2018. This has become an annual event in support of the Stroke Foundation organised under the wing of our Community & Vocation Committee. These days have proved very worthwhile, with a number of people being directed to their GP's for further checks. High blood pressure is one of the silent killers that can sneak up on us unnoticed until it is too late. These events help members of the public be proactive in caring for their health. 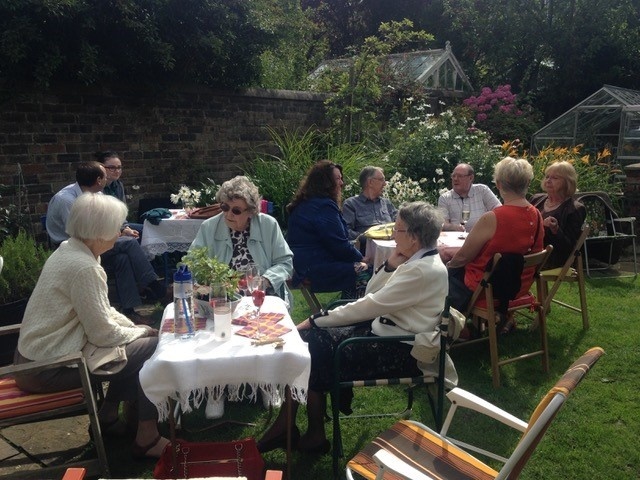 Saturday 12 August 2017 saw some members of Rotary Club of Braids in Edinburgh enjoying an afternoon of camaraderie, prosecco and strawberry & cream scones with partners and friends at a garden party hosted by Stewart Sandilands (Fundraising Convenor) and his wife Gillian. 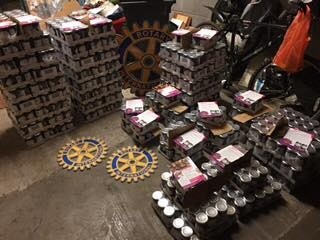 The objective was to help raise funds to support Braids Rotary community projects and our thanks go not only to Stewart and Gillian but their friends who worked hard creating and collecting items to sell on the day and setting up the event. Thanks to the hard work of Stewart, Gillian and their friends and the generosity of the guests, the sum of £725 in the all too short two hours we were there. 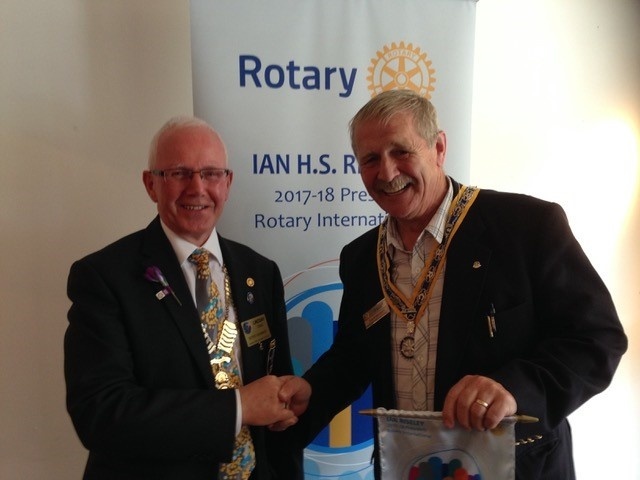 Yesterday, 9 August 2017, our Club was pleased to be able to host District Governor Lindsay at its weekly meeting. 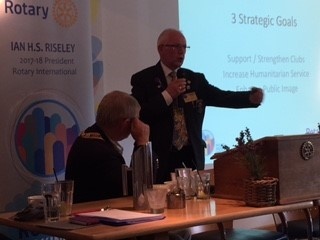 Completely without notes, he gave members a very stimulating and motivational presentation where he recognised all the notable things Rotary International and our own Club achieve and frequently without recognition. He went on to brief members on the new RI President's Theme "Making A Difference" and the manner in which all clubs will consolidate information on our goals and objectives for each year and the way we record our progress and success against those goals. Because Rotary Clubs very often work quietly in the background, the general public is unaware of the tremendously important role we play in responding to world disasters and combatting illness, e.g. as in our aim for many many years to eradicate polio. He finished his presentation by handing over a pennant commemorating the new Rotary International President's Theme "Rotary Making a Difference". 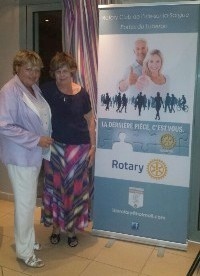 The Rotary Club of Braids continues its work in the community, sometimes without members of the public being aware of. Last year members planted a large number of daffodil bulbs in the grassy area by Tesco's Colinton Store and this spring, we were rewarded when they burst into bloom. Below is a picture of a few of them 'braving' the Scottish spring. This Wednesday 15 March 2017, the Rotary Club of Braids was honoured to host the Rt. Hon. Donald Wilson, Lord Lieutenant and Lord Provost of the City of Edinburgh. He gave members an interesting insight into his roles and duties in this dual role, together with some examples of the highlights during this time. He also got the opportunity to meet four of the five Schoolchildren awarded Georgia Scholarships by Rotary Clubs. A photo opportunity was granted and shown below with the consent of all concerned. 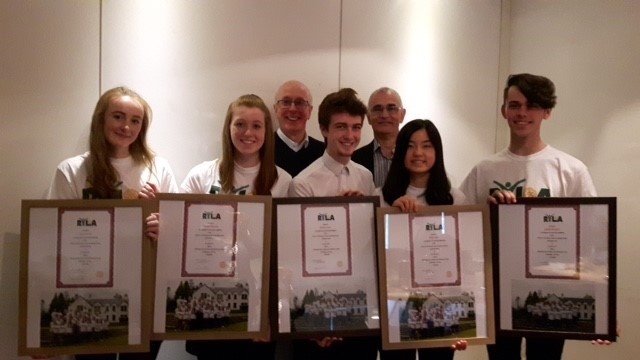 From Left to right Kenneth Skinner (President), Lily Bownes,Ciara Simms, Rt Hon Donald Wilson, Erin MacInnes and Henry Spier. This sum will then be converted to £3 Million by the Bill & Melinda Gates Foundation in the final push of its objective to End Polio. Here you can see packs being prepared for distribution to all Rotary Clubs. This is a truly worthwhile cause and all help in meeting this goal will be gratefully accepted. 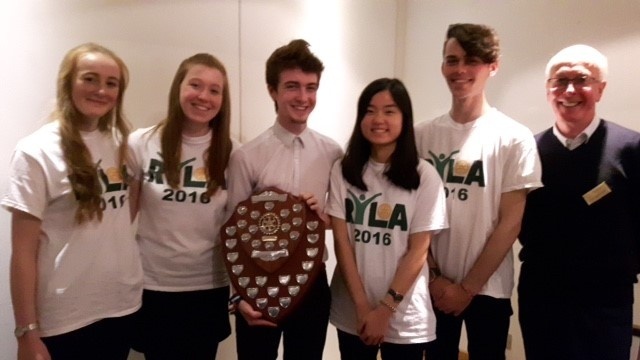 The week ending 30 September 2016, we welcomed our RYLA students with James & Katrina Gibbons from Motherwell & Wishaw RC. James reminded us that for the 26 years that RYLA has challenged young people, Braids Rotary Club has sponsored students every year. This year's group were Louise, Hannah, Robbie, Kelly and Joseph, seen here with our Youth Convenor Rory Mackenzie. Robbie is holding the impressive John Mair Trophy awarded to the best participant, as voted by their fellows. The group had an amazing time and gained a tremendous amount from their week away. Below is that group with their well earned certificates. 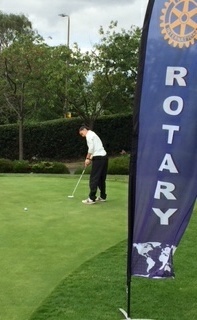 Once again the Rotary Club of Braids, Edinburgh, hosted this annual competition for young golfers. Follow this link to see some of the competitors and learn the results. "During my year in office, I have appreciated the huge amount of support received from Members, Conveners and Past Presidents. In particular Philip Peacock, and his deputies John Stevenson and Jim Strathie who have shared their pearls of wisdom with me. Philip welcomed me to the world of rotary emails. I had not realized how many emails I would receive but have been reassured to know that Philip received almost twice as many. I want to thank Philip for all that he has done as an outstanding secretary, by my side, keeping me on the right track and giving calm advice over the past year. Philip has health issues so I wish him well in the months ahead. The year has passed very quickly, I have enjoyed being your President, lots of happy occasions celebrated to look back on but now it is time to hand the reigns over to Kenneth. Kenneth, I wish you a happy, successful year as President of this fantastic club that I am proud to be a member of. Lisa Wilson, one of the Club's Georgia Scholars returned and visited the club with her host of the past 9 months Rob Ponder of the Rotary Club of South Gwinnett County in District 6910 North Georgia, US. (Pictured above with our very own John Stevenson on the right). 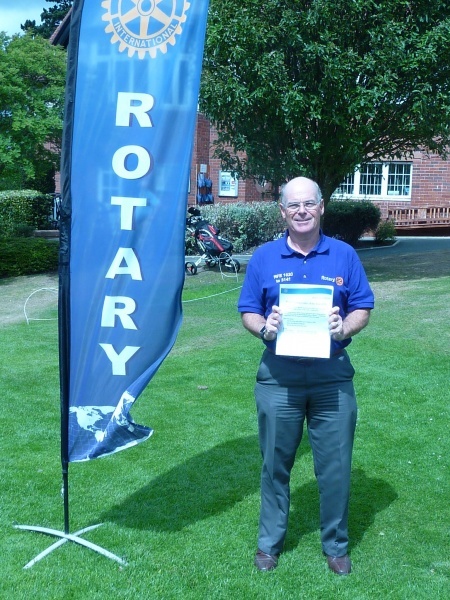 Rob had proved an excellent host, being himself a past Assistant Governer and well versed in the ways of Rotary. He gave our members an interesting and informative impromptu presentation on the origins of the Georgia Scholarship Programme, born to give access to University education to those overseas who could not afford it. The three Clubs in Georgia share the cost of supporting the scholars, fees, accommodation and extramural activities. Their view is that this scholarship is as much about cultural exchange as education. Lisa had proved to be a very popular applicant with all three clubs making her their preferred scholar and having to draw lots. I think that Rob was more than happy that his club was successful. However, he did point out that far from being a holiday for Lisa, she was kept very busy with studies, visits and other cultural activities. We hope that Lisa will attend another meeting to tell members about her experiences and the benefits she received from the Georgia Scholarship. 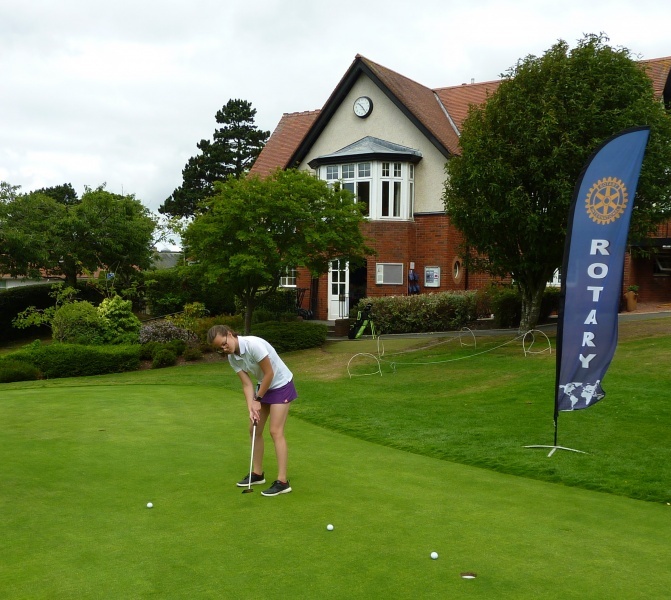 Meanwhile, Rotary Club of Braids, South Edinburgh wishes to thank Rob and his family for hosting Lisa and the Rotary Clubs of Georgia for providing such wonderful opportunities to youngsters around the world. 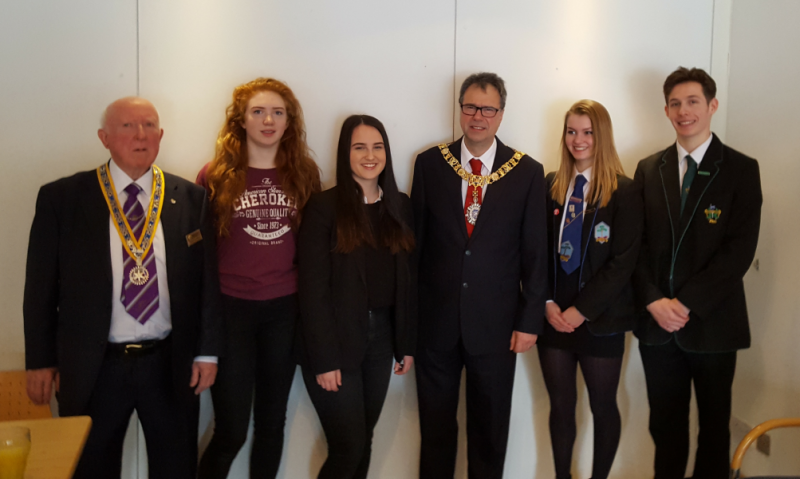 Each year, Rotary Club of Braids, Edinburgh has presented a cup to Firrhill School pupils who have shown initiative and dedication in Citizenship and for involvement in a variety of community projects. 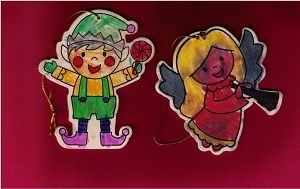 This year, two pupils have been working together throughout the year. 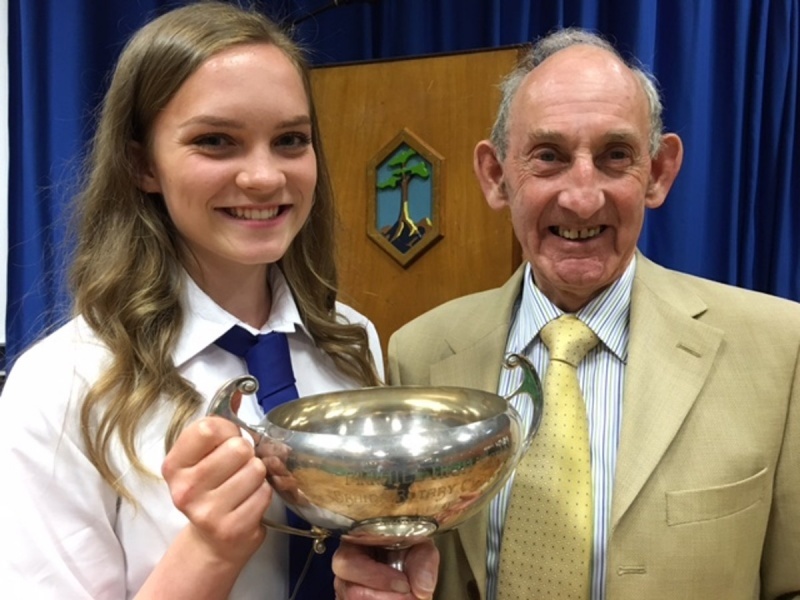 Caroline McNish and John Reid were jointly awarded the Braid Rotary Cup for their role in making meaningful connections with two other schools that form the 'Firrhill Village' - Oxgangs and Braidburn. John Stevenson was pleased to make to the presentation of the cup to Caroline on behalf of Braids Rotary Club. John Reid was unable to be present to hel Caroline receive the cup. Caroline receiving the cup on behalf of herself and John from our very own John Stevenson. Caroline receiving the Braids Rotary Cu from John Stevenson. President Caroline hosted an afternoon tea for lady members and wives of current and past members of the Club. Co-hosted at the home of Rosy Carmichael the guests had a good time by all accounts and the weather was very kind to them, as you can see from the pictures below. 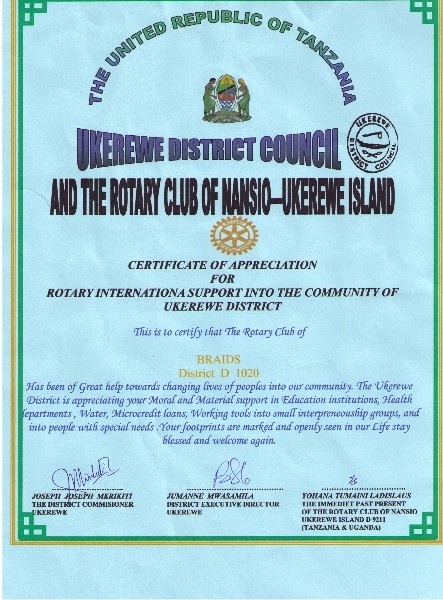 Alasdair Seale accepted the following Certificate of Appreciation from Ukerewe District Council and The Rotary Club of Nansio-Ukerewe Island on behalf of the Rotary Club of Braids for its projects in support of their local community. 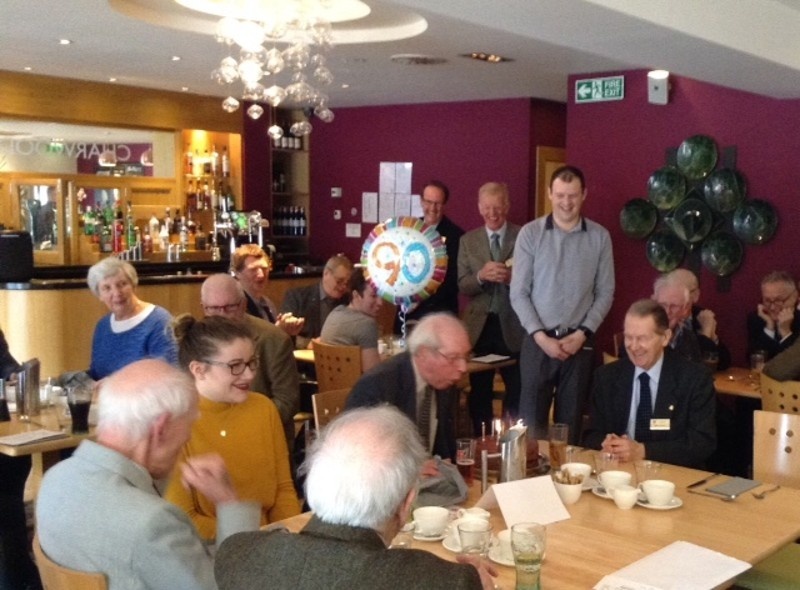 David Duff, who was one of the founding members of the Rotary Club of Braids celebrated his 90th Birthday at Wednesday's Club Meeting. To mark his long and valuable service to the club he was unanimously voted and awarded Honorary Membership of the Club. Pictured with him at the table are three of the remaining founder members, John Cameron, Henry Philip and Mike Munro. As you can see, despite being 90 he still had more than enough 'puff' to blow out all the candles on his cake. st wishes to you David. Between 13:00 and 17:00 on Saturday 16 April 2016. If you are thinking of going, I'm sure that Naomi and her parents will appreciate the additional support. Our best wishes for her future success go with her. Great News. Naomi Anderson, one of the entrants supported by RC of Braids has won through to the District Final of the Young Musician of the Year competition. The District Final will be held at 2:00 pm on Sunday 6th March 2016 at James Watt Centre Heriot Watt University, Edinburgh. All support at this event will be greatly appreciated, so do please come along. Our thanks to M&S at Kinnaird Park, their staff and their very generous customers who helped us raise over Â£3,000 for the nominated charities of both M&S and ourselves yesterday. 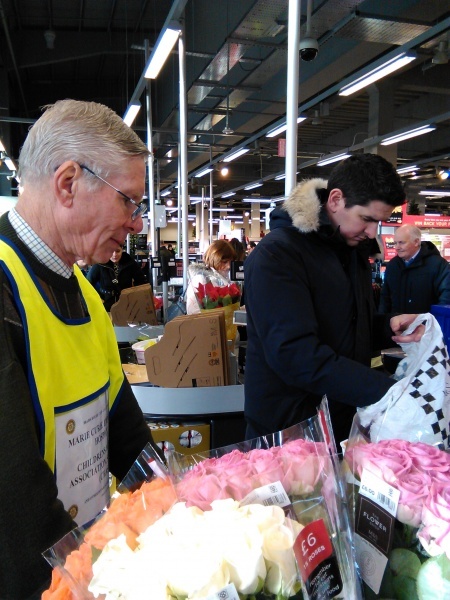 Thanks also to all those Rotarians who turned up to help pack bags at the check-outs or man the 'tin-collecting' at the entrance. Ian here is carefully packing a shopper's bags for him. It just goes to show how our community responds to events because Santa was given little gifts and thank you notes from grateful and excited children as he toured the Buckstone area last night. 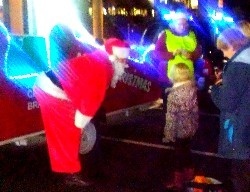 Santa wants to thank the children and their parents for turning out to see him on such a cold night and for their generosity in donating to the local charities we support. 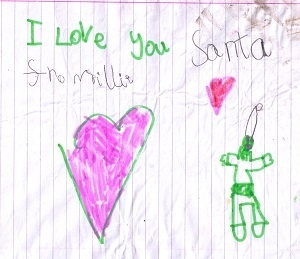 Below is an example of the children's thankyous. 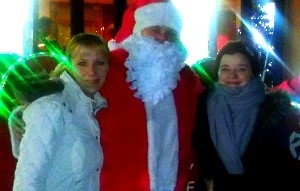 On Monday evening 7 December, Santa dropped into the Charwood Restaurant & Bar to rest his reindeer before visiting local residents. Some children (and mums) managed to get to meet him before he set off and Santa handed out sweeties to those lucky enough to catch him. While members work hard to raise funds and support local communities, we also know how to have fun doing it. 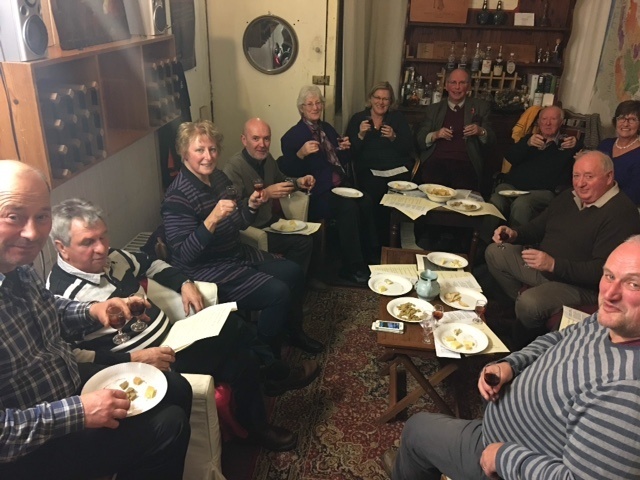 Yesterday (9 November), members met at David Henderson's Henderson Wines to enjoy a port and cheese tasting and so raising more funds for this ticketed event. Below you can see that they definitely enjoyed the experience and assured us that two glasses (one in each hand) was definitely for the purpose of tasting and comparison! President Caroline Kehoe was pleased to welcome visiting Ambassadorial Scholar Amali Aluthgamage from Melbourne, Australia. 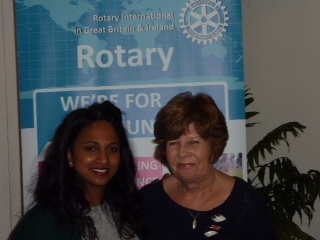 Amali joined our club's lunchtime meeting on 4th November. Recently our President visited France on holiday and was warmly welcomed into a gathering of our French friends. That there was good food, good wine and good entertainment on hand was a happy coincidence!! As you would expect from members of Rotary, they looked after her and made sure she had a good time and there were plenty of members around to do that. 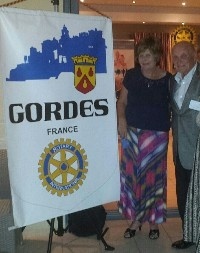 There were four clubs involved, Gordes, APT-Cavaillon, Cavaillon and L'Isle-sur-la-Sourge. 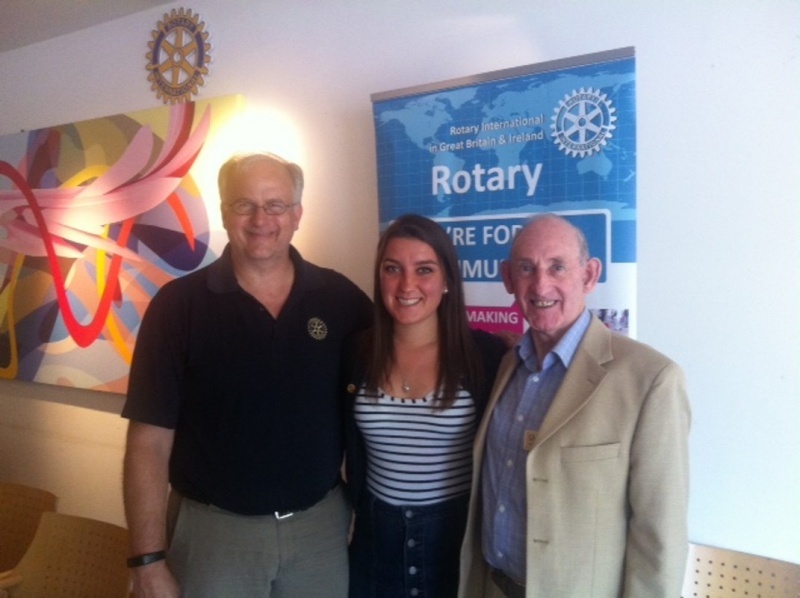 Below left is Caroline with Martine Sanchez, President of Cavaillon Rotary Club and on the right, with Claude Ferrier, past DG of District 1760. Braids Rotary Club Members Get a 'Mine' of Information. Fourteen Braids Rotary Club members enjoyed an informative and fun visit to the Newtongrange museum on 08 September 2015. We were given a private tour of the site by Jim Cornwall. Jim proved to be an extremely knowledgeable and amusing (think of the Les Dawson school of comedy) guide. He explained the long history of the colliery and many aspects of mining (the 1,500ft shaft and cage lift, work at the coal face, processing the coal, the impressively huge Victorian winding system and the life of miners). I think we all discovered things we did not previously know about mining. One member of our group did suggest the being a miner was a “cushy” job (he was joking, I think) but no one seemed prepared to consider mining as a new career opportunity! Thanks to Jim Campbell for organising an excellent outing. This one line sums up everything we think in Rotary. There are so many problems in the world, so many people who need help. And many people say, “There’s nothing I can do.” They sit there. Do nothing. Everything stays dark. But this is not the Rotary way. The Rotary way is the Confucius way. The Rotary way is to light a candle. I light one. You light one. More than 1.2 million people all light one. Together, we light up the world. And this is what I want you to do. I want you all to Light Up Rotary. 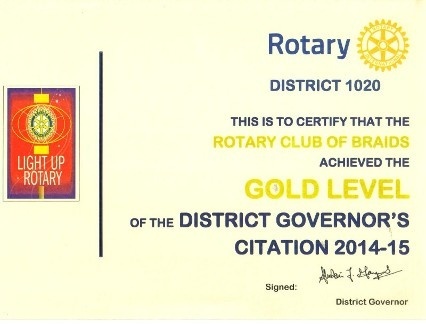 Kenneth Logan as President of the Rotary Club of Braids was pleased to accept the District Governor's Citation for reaching Gold Standard under this banner. The Rotary Club of Braids is a vibrant and active club. Why not join us and be a part of this? 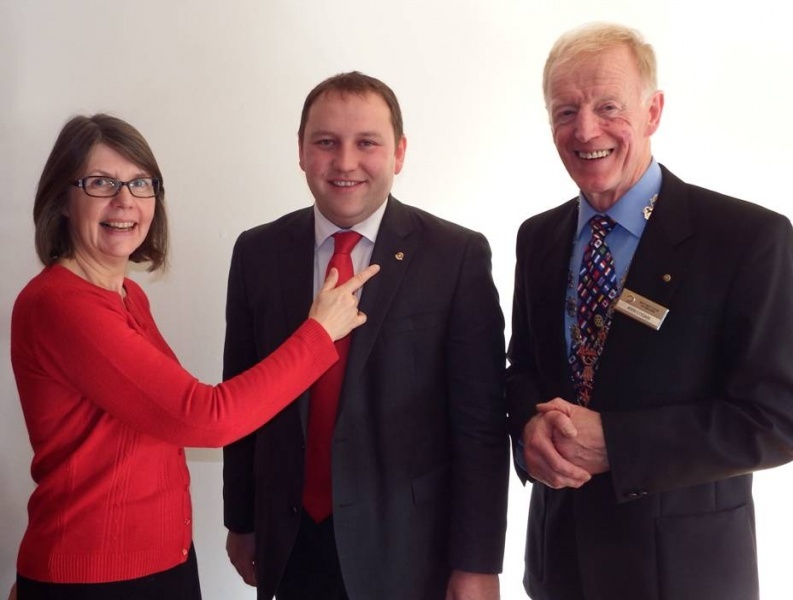 Newest member of Braids Rotary Club Karen Tarn meets new honorary member Edinburgh South MP Ian Murray at the Club's luncheon where Ian was honoured for his services to charities throughout the UK in being instrumental in the introduction of the Gift Aid Small Donations Scheme which, according to the Treasury, could benefit charities nationally by Â£100m during the next financial year. The Club prompted Mr Murray to ask a question in the House of Commons which had led to the introduction of the new scheme. For that reason, Immediate Past President Kenneth Logan (right) was delighted to install him as an honorary member. The Rotary Club of Braids meets each Wednesday at the Charwood Restaurant and Bar, Buckstone Terrace, Edinburgh EH10. We gather at around 12.30 for lunch at 1.00pm and finish sharp at 2.00pm. Kimberley Davidson will give a talk on the work of the organisation Shelter. This will be the Club's AGM and Business Meeting.